The area lying south of the Narva Fortress and stretching to the railway is historically known as Joaoru ("Falls Valley"). From the 17th to the 19th century this area was called Juhkentali. 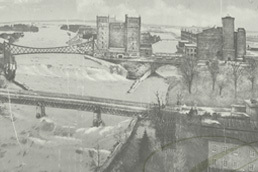 Development in the area grew due to the St. Petersburg-Narva Railway built in 1870, as well as due to the activity of the Kreenholm Textile Mills. The foundations of Kreenholm textile are inextricably linked to the history of the cotton industry in the former Russia. In the mid-19th century, the cotton industry became the most important branch of the textile industry. Ludwig Knoop was inspired to build a cotton processing factory near Narva. He is considered the founder of modern cotton spinning and knitting in Russia and worked as Kreenholm's managing director until his death in 1894. 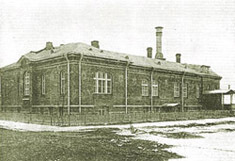 In 1857 the Narva Kreenholm Cotton Products Mill Private Limited Company was founded in Moscow with two million roubles capital. Its founders were businessmen and industrialists Ernst Kolbe from St. Petersburg, Ludwig Knoop, Kosma Soldatenkov and Aleksei Hludov from Moscow and Richard Barlow from Great Britain. Kulgu village, located on the left bank of the Narva River close to the Narva Falls, was chosen as the location of the business. The Kreenholm Textile Mill's buildings were initially built only on the river's eastern island. The director of the mill's financial department Julius Andre was in charge of organising the construction of the manufacturing buildings, as well as those in the neighbourhood intended for the factory workers. The architect of the buildings was R. Heinrichsen and his architectual assistent V. Semjonov. 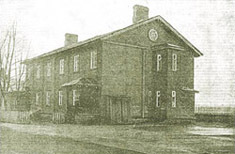 On April 30, 1857 the cornerstone of the old spinning mill was laid in the Kreenholm Textile Mill and by October 10 of the following year, the first stage of construction of the factory or the so-called old half was complete. Initially 8000 spindles were set to work. The cotton knitting mill began operating in August of 1859. The second part of the spinning mill, the so-called new half, was completed in 1861. At the same time the gasworks and bridges were constructed. In 1976 a fourth storey was added to the old knitting and spinning mill. The new spinning mill, named after grand duchess Jelizaveta Fjodornova, was built on the east shore in 1870. A fourth floor was added to the building in 1876. The architect was R. Heinrichsen. Building on the river's western bank began in the 1880s. The Joala Mill was completed in 1884 and its addition in 1890. In 1899, Georg's Mill was built and between 1898 and 1900 the central electric station. The mills were fitted with machines bought from England and the coal needed to heat and power was also shipped from there. Cotton was initially bought from America and later largely from Central Asia. Since there was no trained worked force in Estonia, nearly 300 trained workers from Germany and experts from England were brought in to train locals. By the spring of 1860, 2000 people were employed at Kreenholm and those numbers grew year by year. By 1872 there were 4600 workers and 5300 by 1894. In 1911 the number of workers employed by the Kreenholm Textile Mill reached 10 000 and remained at that level for the following three years. Kreenholm had become a huge enterprise, the likes of no other in Russia. Regardless of the fact that Kreenholm was the most modern textile business in Russia at the time, a lot of the production was hand-made. In the 1890s ring spinning machines were incorporated, in addition to mule spinning machine. Production on the mechanised cloth looms was also speeded up. In 1909, 14 modern looms were set up, which enabled the weaving of patterned cloth. 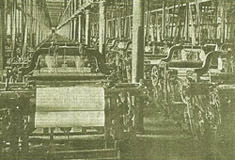 The first 50 automatic looms were purchased prior to WW I.
Kreenholm specialised in the mass production of cotton thread and raw cloth and therefore the variety of the products was quite limited. Until 1914 only 15 types of cloth were made. The bulk of raw cloth made at Kreenholm was sold to the patterned cotton fabric factories of Moscow's industrial neighbourhood. The breaking out of the World War in 1914 greatly effected Kreenholm. On April 25, 1919 the Red Forces bombed Narva with cannons, with Joaorg being the target. As a result of the bombing 137 houses burned down and 37 buildings were partially destroyed. In the early 1920s, the area was rebuilt according to the old plans. Difficulties with keeping the business supplied with cotton and fuel hindered normal production. Of the output, 95% went to the armed forces and 5% to the free market. In the summer of 1918 production stopped, since the cotton supply ran out. The company was forced to cut production rates once again in 1921 and reduce the workforce from 2200 to 1600 due to difficulties in revenue. In order to continue, Kreenholm Textile Mills was forced to rearrange its production according to market demands. Kreenholm began to produce fine yarn for the clothing industry and net twine for fishermen. Kreenholm's own knitting factory needed various types of yarn for weaving textiles as well. Thereby the production of yarn grew from 671 tons in 1920 to 2,5 million tons in 1927. 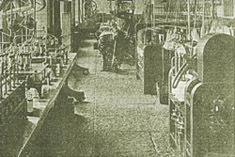 Higher-quality fabrics were finished in Germany, Czechoslovakia, England and Switzerland, simpler types of fabrics were coloured in dying workshops on the premises. It was only as of 1926 that a new department was opened in Kreenholm for dying yarn in order to knit fashionable patterned clothes. The production of synthetic silk and mixed cotton fabrics was also begun. As a result of the reorganisation, Kreenholm's level of market competitiveness and production increased. In the second half of the 20th century, Kreenholm exported 80% of its yarn production and 70% of its cloth production to Scandinavia, Germany, Poland, Lithuania, Latvia, Finland and elsewhere. In an aim to improve the structure and functioning of the internal market, large companies dealing with cotton manufacture proceeded to divide the market up in 1928. Together the Kreenholm Textile Mill, Baltic Cotton Spinning and Weaving Factory and Sindi Broadcloth Factory formed the commercial-industrial public limited company "Kreenbalt", which was given sole rights to sell the companies' products on the local market. The first year of operation already brought in a 10 000 kroon profit. The range of products grew each year. The finishing of Kreenholm's fabric abroad was halted and the final stage of production (including that of the Baltic Cotton Factory) was completed at the Sindi Broadcloth Factory. In 1928, Kreenholm and the Baltic Cotton Factory together took on the conquering of the Latvian and Lithuanian markets. The questionnaire of 1934 showed that the local textile industry was able to keep up with internal market demand of cotton fabrics almost entirely. WW II, which began in 1939, culminated for the Kreenholm factory with the almost complete bombing and destruction of Narva. Both the new spinning factory (named after grand-duchess Elizaveta Fjodornova) on the east island and Georg's factory on the western island were reduced to rubble. The Joala factory and the old spinning and knitting factory were spared. In 1940 Kreenholm was nationalized. Within the framework of the Soviet Union, the entire factory was put to use in the production of textiles. Between 1944 and 1967 all of the old production facilities were put into use and the Georg Knitting Factory, which was almost completely destroyed in the war, was rebuilt. By 1980 the number of workers in the company had grown to 11 032 people. In 1992, following the break-up of the Soviet Union, the new owner of the company became AS Kreenholm Manufaktuur ("Textile Mill"). The company's management tried to find its place in the new market economy. The sewing factory opened in 1992. In 1995 Swedish company Boras Wäfer privatised Kreenholm Manufaktuur and AS Kreenholm Holding was created, which sells its production to Estonia as well as Europe. In 2007, plans were made to stop production in Kreenholm's historic block and adapt the spaces for new, non-industrial purposes. The main industrial buildings of the Kreenholm Factory were built on two islands: the eastern Kreenholm and western Joala islands, in close proximity to the two falls. The first stage of factory buildings (the old factory, new E&F factory, gasworks and warehouses) were built of limestone quarried from the same Kreenholm Island. Architecturally these buildings are rational: monotone rows of windows running along unplastered, smooth limestone walls, emphasised only by fired brick lintels. A graded cornice, marking the former roof's eave line, can be seen running between the 3rd and 4th floors. The buildings' corners are emphasized by stairwells, whose top floor (a water tank), rises above the roof ridge as a square tower. The towers' facades are decorated with corner pilasters. The second phase of construction included the buildings on Joala Island: Joala and Georg factories and the lumber drying department. Joala factory is built in the style of a traditional "English" textile mill, with exterior walls made of brick and vaulted brick ceilings in its six floors, supported by cast iron posts. An similar textile mill building is located in Tallinn – the Baltic Cotton Factory's main production building. 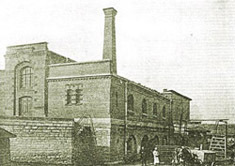 The architecture of Georg's factory was ultramodern for its time: the factory's outer walls were made up of a metal frame, into which a brick wall was built. Large, multi-paned windows made up most of the walls of the eastern and western facades. The projecting stairwells were also almost entirely made of glass (the building was destroyed in WW II; only the corner towers remain). Georg's factory's massive corner towers and the design of its end walls shows the continued use of historicist elements of style, however it also boldly leans towards stylised geometric aesthetics. It's interesting to note the similarity of the Georg factory with classic church architecture: in the centre of the southern facade is a round window, above which are wall niches seemingly awaiting sculptures. The niches continue on the upper reaches of the majestic towers without roofs. 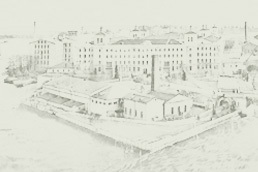 Along with the factory buildings, housing for employees was simultaneously constructed on the Narva River's west bank, near the Kreenholm Factory. Inspired by the progressive working class neighbouthoods of England, the Kreenholm district aspired to be an ideal model of society, where everyone's material and spiritual (including aesthetic) needs are met to the fullest. The area had its own school and kindergarten, Lutheran and Russian Orthodox churches, large hospital complex, stores, detention house and clubhouse. With its own infrastructure, the Kreenholm factory neighbourhood was a kind of satellite-city to Narva. 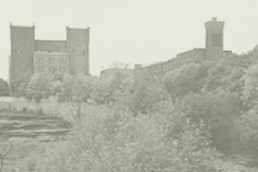 Administratively, in the early 20th century Joaorg was the Kreenholm Textile Mill's workers' neighbourhood, as of 1917 Joaorg was considered part of central Narva. Emphasis was placed on the architecture of buildings. Historicist architecture became most prevalent throughout, with touches of Neo-Roman, Neo-Gothic and Neo-Renaissance. The hospital building alone is Art Deco. Without exception, the first buildings to be built in the area were built exclusively of wood, since stone structures were not allowed to be built closer than 1,4 km from the Narva Fortress. In 1864 Narva was taken off the list of fortresses and the construction of stone buildings in the previously banned zone was permitted. Photo album: Next stop "Kreenholm"